I found this while on one of my bicycle rides. Out 50 miles and then 50 back for what is called a century. This is close to my turning point. There are two industries here along with an interchange between the Indiana and Ohio Railway (ex DT&I) and Norfolk & Western (ex PC/NYC and Wabash lines). The industries are both steel based but two different companies. The West plant is Worthington Steel (http://www.worthingtonindustries.com) and the east plant is North Star BlueScope Steel LLC (50-50 joint venture between Cargill, Inc. and BlueScope Steel Ltd. Cargill, http://www.northstarbluescope.com). Each industry does its own switching. 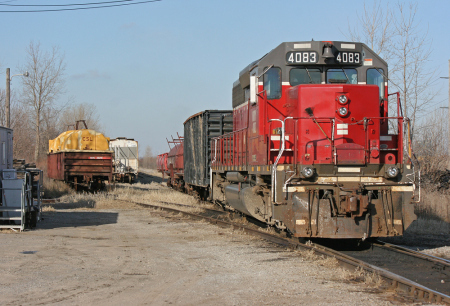 Worthington Steel has been seen with both a blue switcher and a red switcher. Not sure which is currently used or if they keep and extra stored inside one of the buildings. The red switcher can be seen in the satellite from Bing (http://tinyurl.com/amoe4zn), while Google (http://tinyurl.com/c35lw55 ) shows the blue one. 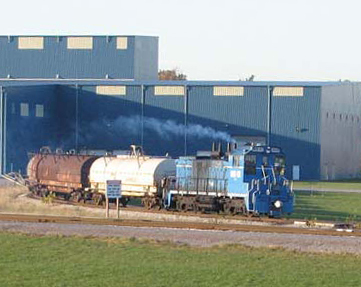 North Star BlueScope uses at least two switchers and one is a remote controlled mule. 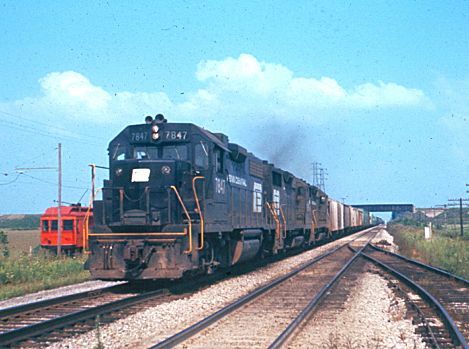 The adjacent interchange is unique as the I&O passes over the N&W using a few miles to gain the necessary height (this is NW Ohio where the common description is pancake). The overpass was built when Henry Ford had control of the DT&I. At one time there were two long spurs from N&W line to the I&O to create a wye. One leg served the PC/NYC on the north side while the south leg interchanged with the Wabash. The south west leg of the wye has been disconnected at the N&W end. This is now used for storage from the I&O side. Interchange is now made through the small yard adjacent to North Star BlueScope. The location could easily be modeled in part or whole. With the over/under arrangement, a layout with figure 8 arrangement could even be devised to provide constant running with prototypical switching mixed in. Worthington Steel could be modeled by itself as an inglenook. North Star BlueScope has many interesting modeling points and could create be designed as a switching layout that could keep 2-3 people busy for hours. If anyone has the inspiration to create a track plan for a small layout, I would be happy to amend this article with it and provide the appropriate credit.